Programs and documents destined to impact and shape the religious and political course of mankind. Most people have debunked the ‘conspiracy theory’ as far fetched. However what most people do not realize is that humans are just playing into the hands of a deception of gigantic proportions... ushering in the Antichrist. The co-conspirators themselves are not human. Far from being outdated, out of touch, and largely irrelevant to modern society, the Kingdom of God Jesus was sent to earth to proclaim (No, His main message wasn’t about ‘love’) is exactly the utopian world most men and women can only dream of, not some pie-in-the-sky ethereal place the other side of Pluto where everyone exists in a state of disembodied blessedness. However, there is also a warning. The Bible very clearly tells us that we all have a choice to make in this life - the most important decision we will ever make. And, if the Bible is indeed the word of God, as it claims to be, and Jesus is the Son of God as He said He was, the consequences for the individual who chooses to ignore the ample evidence, or counter it with clever arguments, will be fatal. ‘Why do the nations rage, and the people plot a vain thing? The kings of the earth set themselves, and the rulers take counsel together, against the Lord and against his anointed saying, ‘Let us break their bonds in pieces and cast away their cords from us.’ Psalm 2. So how does all this work? Djwhal Khul inspires Bailey; who inspires Muller; who then writes the World Core Curriculum to train our children. In the meantime, Maurice Strong operates his New Age ranch, complete with a Zen Buddhist temple, while reinventing the United Nations, preparing it to rule the world. However Djwhal Khul never existed. He was Alice Bailey's spirit guide. Absolutely incredible, but true! Peaceful political entity or the fifth and final gentile kingdom spoken of by the prophet Daniel? Major Prophecies in Daniel 2 and 7 indicate that the Holy Roman Empire will be the dominant force in the world when our Lord returns. Twenty five hundred years ago Daniel saw the Roman Empire revived from the dead in the end times. Then, in September, came quite a shock: The EU, at an astonishing art exhibition sketching the future of the organisation, described itself under the heading : "Roman Empire Returns." The question to be asked is whether the UN has any ties to the occult. All the hype by Robert Muller and various other prominent occultists may be the product of very fertile imaginations, or simply wishful thinking. But on the other hand is the UN part and parcel of the whole ‘return of the World Teacher and his cronies... the Ascended Masters/ peace and safety scenario? To answer that question we need to turn our attention to a very interesting organizations... The Aquarian Age Community. 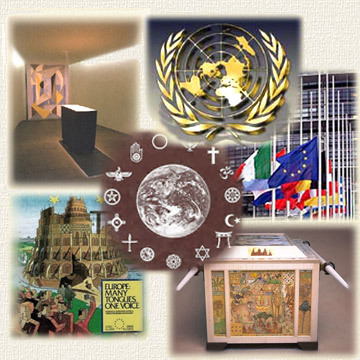 Chronicling the progress of the ecumenical/interfaith movement, pointing out the movement’s interconnections with the Vatican, the UN, and various New Age organizations. The Global Ethic, which was signed by Muller and the other interfaith dignitaries present, is emerging as a companion to The Earth Charter and is expected to be to religion what "The Charter" is to international politics. Together, these documents are destined to impact, if not shape, the future course of mankind. The World Core Curriculum is intended to accommodate both decrees by promoting their ideas through public education. It might seem odd to accuse the New Age prophets of these things. After all, they and their followers appear to be nice, well-cultured people who use the correct fork at the dinner table; they claim that their goal is the betterment of the human race and of the Earth. Nevertheless, these radical New Age leaders believe that the two World Wars were necessary for human evolution, and that the birth pangs of the New Age began with the atomic explosions in 1945. They also advocate sending those people who are unwilling to enter the New Age into oblivion, and reducing world population to 2 billion - or less. Such is the blood lust of the "compassionate." The pressure is mounting for interfaith communion and dialogue. Christians seem to totally forget that they are followers of the man who called the Pharisees white-washed tombs and drove the money- changers out of the temple. We are students of the Apostle Paul, who called down God's curse on anyone who preached a different gospel, the man who publicly confronted Peter. In church history, the Reformation was a monster-sized split in the church, and yet many of us are grateful it happened. Yet we cosy up to organizations like the World Council of Churches, which is is one of the worst of the apostate bodies claiming to be Christian, with their involvement in goddess worship, paganism, ecumenism and every other conceivable form of deviancy.